It’s a happy day when a favorite author-business philosophers integrates two favorite qualities into 121 concise pages. Edgar Schein has done this in Humble Inquiry: The Gentle Art of Asking Instead of Telling. He argues simply and elegantly that creating positive relationships between people is the key to good and reliable communication across boundaries, which is in turn essential for organizations to be effective. This can be achieved when leaders take on a genuine attitude of caring and interest in other people, learning the art of Humble Inquiry in order to build relationships that facilitate relevant, task-oriented, open communication across status boundaries. Whether in hospitals, nuclear power plants, airlines, warehouse, factory or office-based business, low-level employees must feel safe in order to discuss problems with their leaders early and often. Fear shuts down the brain and makes us less capable of smart decisions, allowing mistakes and accidents happen and go unaddressed. 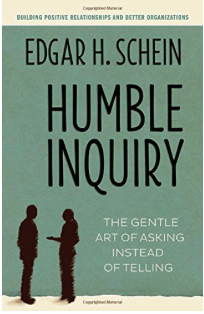 Schein makes the case for Humble Inquiry as a means toward “…a social mechanism that overrides the barriers to communication across status lines where humiliation is a cultural possibility”. What Schein calls “cultures of do and tell” must be shifted to “cultures of relate and ask”. Diagnostic inquiry involves asking question that steer the conversation as well as the other person’s mental processes. Process-oriented inquiry is a meta-conversation, shifting the conversational focus onto the conversation itself by asking about the process of the conversation and not the content. This allows the other person know that it is a two-way conversation and that the conversation can reviewed and adjusted. Humble Inquiry maximizes curiosity and interest in other while minimizing bias and preconception about other people. It is necessary to access one’s own ignorance and ask for information in the least biased and threatening way possible. Schein advises the reader to take up the Humble Inquiry practice within a “cultural island” within the organization, creating a situation in which certain cultural rules pertaining to authority are suspended with the aim of bringing a team together. Examples include off-site activities that are more social, personal or recreational in nature. Standard relationship-building and team-building environments, but with the explicit aim of practicing Humble Inquiry with the purpose of strengthening good and reliable communication between people. This book is an instant classic, an excellent practical guide to following Deming’s call to “remove fear from the workplace” and required reading for continuous improvement consultants, sensei, Lean masters, agile coaches, healthcare professionals of all stripes. In fact we would all benefit from learning to ask before telling. Leaders wishing to create more adaptive, innovative and sustainable organizations will benefit from spending a few hours digesting this book and the rest of their lives practicing Humble Inquiry. A definite “must read” for anybody working in an environment where the collaboration and working together of people is task relevant. Lean Thinker Challenge #4	What does ‘right first time’ mean in an R&D environment?